Bri McKoy, of the blog Our Savory Life, celebrates the power of the everyday table and shows how, by regularly and intentionally gathering around it, we can follow in the footsteps of Jesus and usher in grace, love, and deep fellowship. Raised in the world of takeout and microwaveable meals, like so many busy women Bri McKoy found herself utterly lost in the kitchen and nowhere near using her dining room table as an inviting place of community. 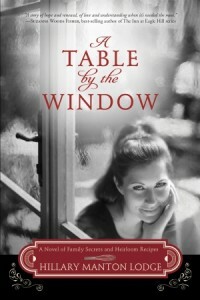 However, as she learned how to more intentionally invite not just others but also herself to her table every day, she noticed that the kitchen stopped feeling like a prison cell and started feeling like a sanctuary, that gathering with others around the table, like Jesus often did during his time on earth, had the power to usher in deep relationship and a fuller understanding of God’s love and grace. In Come and Eat, Bri invites readers on an adventure of burnt pie, ten-pound bags of onions, and kitchen catastrophes to discover how to transform a common dining-room table into a vehicle that ushers in the presence of Jesus. It’s an invitation with no pressure, no strings attached, no advanced cooking skills or fancy accouterments necessary. Just a healthy appetite and a desire to take a deeper look into the power and ministry that can be found at the table. Combining biblical reflection with engaging personal stories from Bri’s own home, as well as the tables she has joined around the world, Come and Eat shows readers how they can intentionally make their own tables a vibrant source of life. This is one of those non-fiction books that you pick up and feel like you were pulled up to the kitchen table with the author. Bri has a honest approach to life as she engages you in story, encouragement and a lovely way of giving practical ways to create your own hospitality and ministry to others. It is done in a relevant way to women of our culture and time period, complete with Paleo recipes that can be served with carbs or without. You will find your mouth watering as the soul feels fed as well. You will find yourself laughing, tearing up and licking your lips. I received this book from Book Look Bloggers. The opinions contained herein are my own. This book is available for purchase from local booksellers and Amazon. This simply written book gives plenty of great ideas on connecting with family and making new friends with your neighbors. For me, as someone that deathly afraid of getting too close to anyone who lives in the near vicinity, it had some very scary ideas, but it is good to stretch my mind. I liked the simple ideas filled with connection that pull people. I thought of that cheesy commercial, where everyone brought tables into the hallway and their dinners out to share with one another. Overall, amazing concept, great book and one I will want to buy as gifts for a few people. This book was given to me for review by BookLookBloggers. The opinions contained herein are my own. One of the most sought out food destinations in New York City sits at the end of the number 7 train in Flushing, Queens, where adventurous eaters trek for the best Chinese dumplings. Now you can easily make them at home with recipes for the classic and unexpected fillings and folds along with dipping sauces, salads and other dim sum. Looking for a cute little cookbook to add to your repertoire? This is a great one to pick up. I remember when I first made my own dumpling wrappers, simply because I was too poor to buy them. I was introduced to a new world! This little cookbook will have your mouth watering. The recipes are easy and so simple you will wonder why you ever purchased pot stickers or wonton wrappers at the grocery store before. If you are a healthier eater, this book has healthy recipes that you will enjoy as well. I loved the photos throughout the book and the stories in the introduction. You will love this lovely little book as well. Blogging for books provided me with a copy of this book for review. All opinions contained herein are my own. Thanksgiving was a challenge this year to get to. I had decided that on top of our normal busy schedule with basketball, school and other baking, I would add extra baking to earn a little for some extra expenses. It took some extra work, as on the day I decided to bake, we also got a small storm. That would have been fine, but everyone had been busy and we discovered too late, that the tires I had for winter, didn’t fit. All day Tuesday, besides baking, we went through all our tires. Then I found a pair that looked like they would work. The roads were ice covered and there was no way to drive to my mom’s without snow tires safely. I juggled tires, and then bought a pair that looked great. The rims were universal and should have fit, but alas. They were not universal for my car. I had called tire places and everyone was booked up to put tires on, which is what I was trying to avoid. As I was about to give up hope, a friend with a tire shop called and said that he had an opening. I hurried over, tires and a pan of cinnamon rolls in hand. We were on the road soon after leaving the shop. I forgot a bunch of things on my list, but we were on our way. On the way up, we passed my sister and her husband on the side of the road. Their tire on their travel trailer had shredded and the jack in their borrowed truck was no where to be found. Thankfully, my little Honda jack worked for them and we followed them into town where we helped my mom prepare and serve a meal to thirty youth and leaders, besides the twenty that were of our family. She made a delicious meal of Stuffed Shells, Baked Ziti, salad, garlic bread and pie. All the younger children helped serve it. We were exhausted when we got to the house with aching feet, but I finished up my writing for the day anyway. I was reminded of my friend, Tiffany, whose passing has left me somewhat stunted this month. She came for Thanksgiving quite a few years back now. We had an exciting trip to my mom’s house that year too! I mulled over my memories, cried a little and have been moving forward. It has not been easy though. The loss of my friend and my grandfather this year has left tears hovering just below the surface more times than ever in my life. On Thanksgiving day, most of the work has been done previously. I work very hard on Tuesday to make sure of that. I put together my breakfast casserole the night before with shredded potatoes, eggs, cheese, sausage and vegetables and put it in the oven in the morning to feed the horde. I served it with cinnamon rolls and salsa this year. The stuffed turkeys were placed in bags and roasting while everyone ate breakfast. The peeled potatoes were waiting to be cut and mashed, and sweet potatoes roasted along side the turkey. Everything was done and ready to eat at the right time and tasted wonderful. We were trying to be better about how many pies we made this year, and ended up with about 21 or 22. There was also a crisp and a cheesecake as well. It was a good amount. There was plenty for pie for breakfast the next morning for the children, lots of sugar free desserts for those on that plan and everyone was happy. We were missing a few people, which was hard, but over all, it was a very nice Thanksgiving! Whenever I ask the boys what to make for dinner, I generally can expect two replies! “Lasagna! !” and then when I tell them I don’t have the stuff for it, the next on the list is “Pizza! 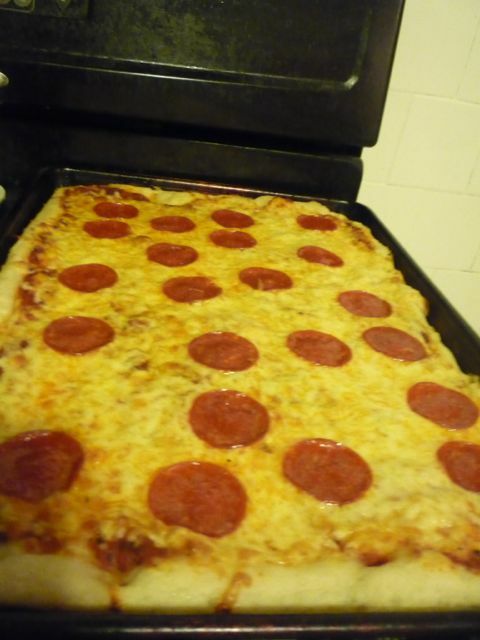 !” Homemade pizza is always a hit, although I have to make a few more to fill them up for the night. So, this week, we will put Lasagna on the menu. I got some lasagna noodles cheap, so maybe we can swing the rest. It is always fun creating a menu on a budget. Limited resources, high food costs (which I am hoping will drop with gas prices) and hungry boys are an interesting combo for a tight budget. This week, I will be looking to stretch it a bit, but be creative! D: Pork Chops, mashed potatoes, corn on the cob. There are times you want a fast paced romantic story, and other times you want one that digs deeper. This is one of those books that digs a little deeper. Juliette seemed so down to earth to me, I could relate to her family as well. I loved how it showed her love for her family, yet her frustration with them at the same time. The details in here on the old family recipes was one of the best parts of this book. It might have been the recipes that made the book slower to read and digest, but throughly enjoyable. The food descriptions were so well done, you felt you could almost smell and taste them through the page. The family mystery was understated, but woven through the story, in an effort to keep that question always coming up. You always know that families have secrets, but this one was not as dramatically done, but done well. It is for sure not suspense. The book is more a woven book of word pictures, of a close family that loves cooking for people. I think this was one of the reasons I enjoyed the book so much. While our family does not own a restaurant, we have always spent time cooking for others, large groups and really enjoyed it as a whole. I am looking forward to trying some of the recipes in the book. One of the other things I honestly enjoyed about this, was Juliette loved to write about food as well, and she was good at it. That sparked all kinds of ideas for me. This book was given to me for review from Blogging For Books. The opinions contained herein are solely my own.